Our Cedar Lake Logger Deacon's Bench is constructed from naturally aged cedar. 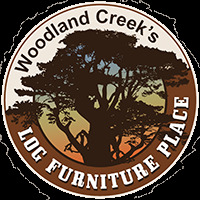 Each log is hand peeled, preserving some inner bark and burls, knots, and beetle runs that give your furniture natural beauty and character. If you like this awesome, rustic half log look, be sure to stop by the rest of the Cedar Lake Logger Bedroom Collection. Half log panels and drawer fronts.